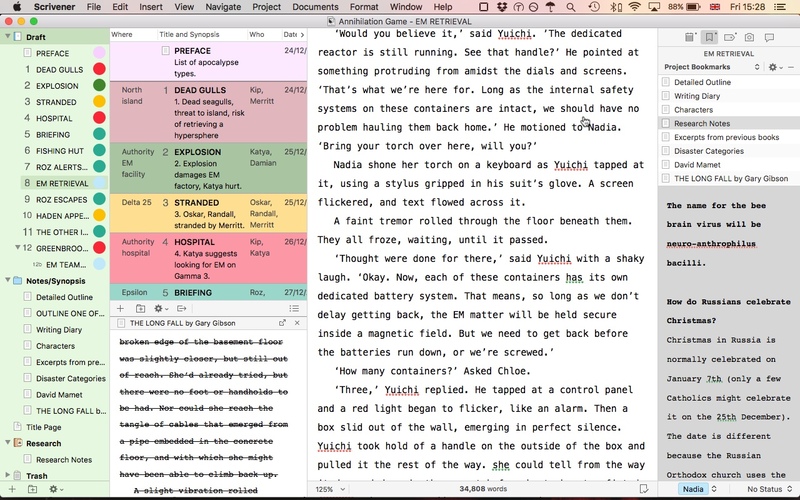 SF writer Gary Gibson: Scrivener 3: my review. 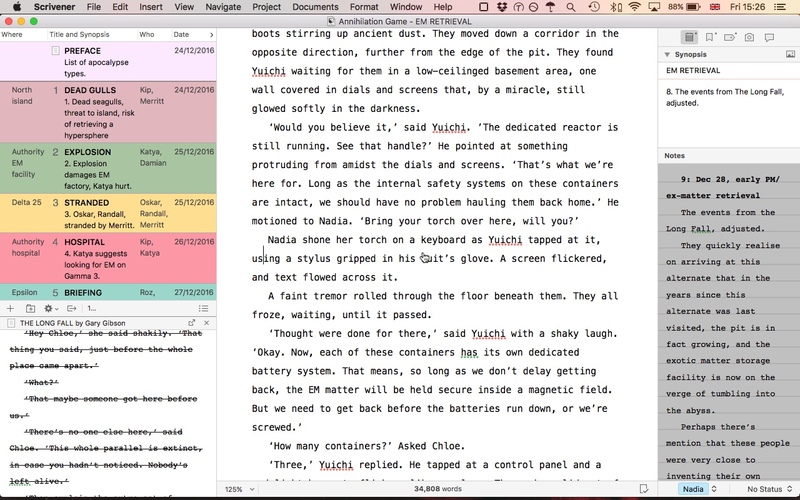 Scrivener 3 is officially out! I've had the opportunity to beta-test it for the past six months or so, and what's really amazing is that it improves on something I might once have said couldn't be improved on. Note that right now the Scrivener 3 update is for Mac users only: my understanding is the Windows upgrade should be available sometime next year. In the meantime, let me have the great pleasure of showing some of the ways I've made use of it so far. They have, so far as I can see, rebuilt it from top to bottom, and essentially rationalised much of the program. If you're familiar with the old Scrivener, you'll know it featured such tools as a scratch pad, but that's all gone now (Correction! It turns out I'm wrong about this, and in all this time I managed to miss it: it can now be found under Window->Show Scratchpad). Instead, there are merely documents, and bookmarks. At its most basic level, Scrivener 3 is split into three areas: the binder on the left, the inspector on the right, and the text editor in the middle. Scrivener refers to a book and all of its associated files as a 'project', and when you open Scrivener for the first time, it asks you to create one. It's a project rather than a book because each Scrivener project holds not only the text associated with a book, written or unwritten, but all the other miscellaneous notes, reference images, web links, character sketches and so forth that go into the creation of the central document. As before, the binder on the left contains several folders, central to which is the Draft folder. As you write, you can split a document up into chapters, and these become visible as separate text documents in the Draft folder. When I first started using Scrivener, I was more familiar with writing in Word, which presented a book's text as a single long scrollable file. Fortunately, Scrivener has something called 'Scrivenings'. When you click on the Draft folder and select to view it as Scrivenings (View->Scrivenings), it presents all your chapters as if they were a single, long, scrollable document - and indeed that's the way I, and many people, I think, prefer to write. This doesn't prevent you from (say) moving chapters around inside the Draft folder, or splitting them or merging them together, depending on what your novel (if that's what you're writing) requires. That, as always, is one of Scrivener's strengths. So far, so familiar. But the real power of Scrivener 3 lies, for me, in the inspector bar. Near the top of the Inspector bar are five icons in a row: Notes, Bookmarks, Metadata, Snapshots, and Comments/Footnotes. The important ones for most people's purposes are Notes and Bookmarks. When you click on Notes, you get a box for a brief synopsis of a chapter, and below that space for lots and lots of, well, notes. Even if you've got a bunch of chapters displayed as a single document in the main editor, you'll see that same notepad and synopsis box. You don't have to use them, but they're damn convenient. The notes displayed are chapter- or document-specific. If you display a particular chapter in the main window, or any other document, you'll see any associated notes you have there on the right. The real power, for me, is in icon 2 - the Bookmarks. For instance: say you have several chapters or documents displayed on your main editor as a single scrollable file (View->Scrivenings). But say you want to refer to notes that aren't chapter- or document-specific, such as an outline. Say that outline is saved as a text file in the binder, under 'Research'. You click and drag it across the screen and drop it into the Bookmarks window. It then remains there, with its text displayed below where you can easily refer to it. You can bookmark as many files as you like. Great, or what? Note that while you've selected Bookmarks in the Inspector, a panel reads 'Project Bookmarks' near the top. Click on Project Bookmarks and you'll see you can also select something called Document Bookmarks. Perhaps, while working on Chapter 2, you want to refer to events in Chapter 1. 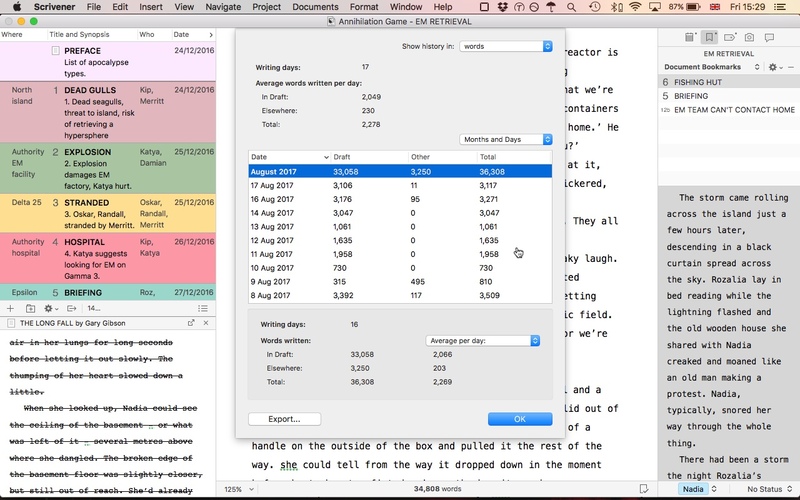 While Document Bookmarks is selected in the Inspector, and while Chapter 2 is open in the main editor, you could drag Chapter 1 from the Binder into the Inspector. This creates a bookmark specific to the document you're working on in the main editor. From now on, whenever you select Chapter 2, and so long as the Inspector is set to Document Bookmarks, you'll see the text of Chapter 1 for easy reference. Why is this great? Because the power of Scrivener lies in being able to have a large number of different documents open at once so you can cross-reference them while you work in the Main Editor. 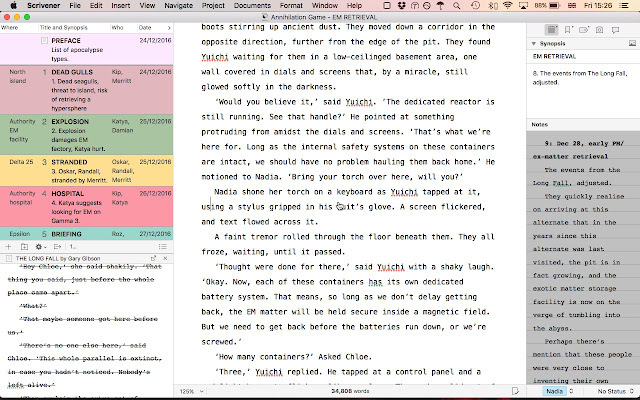 Document and Project Bookmarks make this much easier and, for me, the main selling point of Scrivener. Of course, there's more - particularly the Copyholder. Perhaps as well as Chapter 1 and Chapter 2, I also need to refer to my outline. Then I might switch to Project Bookmarks, right-click on my bookmarked outline in the Inspector, and select Open in Copyholder. This opens the outline in a small window for reference (see below). It's all about getting as much relevant information in front of you, at once, as possible. This is a screen grab of a short novel/long novella I've been writing. From left to right: Binder, Main Editor, and Inspector. The Main Editor is further split into two vertical windows (to get this, navigate to View->Editor Layout->Split Vertically). 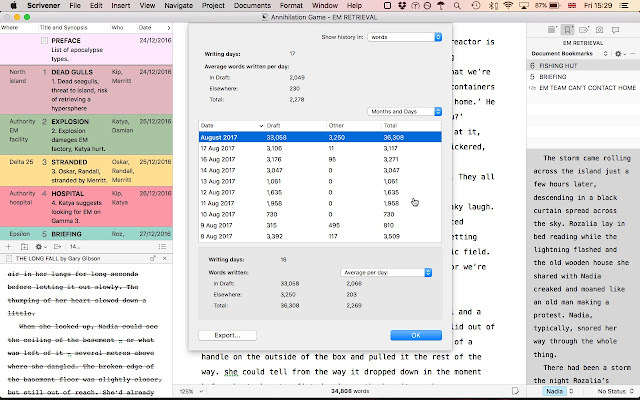 The left-hand window displays the book-in-progress in Outline view. This allows me to check various items of metadata associated with each chapter, such as: where, when, and who, as well as a brief synopsis. Over on the right, you'll see I've selected 'Project Bookmarks', with a list of bookmarked files beneath. Note that many of the same items that appear in Project Bookmarks also appear in the Notes/Synopsis folder in the Binder on the left. While writing, I keep the Binder hidden. As you can see, I also have a chapter open in Copyholder beneath the Outliner. I get that by right-clicking on - in this case - the lowest item in Project Bookmarks and selecting Open in other Editor's Copyholder. This gives me the maximum amount of information as I work, allowing me to access notes and ideas, other chapters, as well as keeping an eye on which characters feature in a scene, and when. 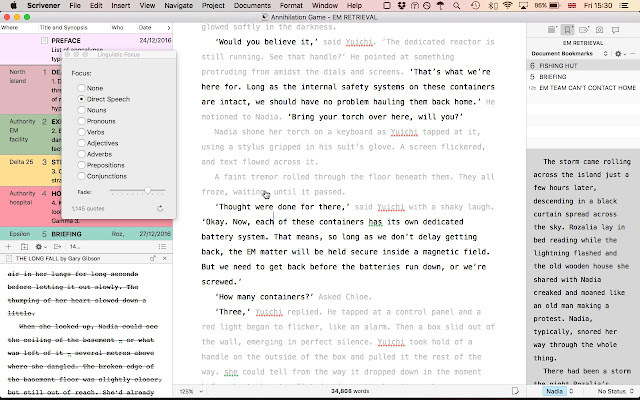 If, like me, you're something of a stats junkie, Scriv 3 will give you endless detail concerning your writing habits. How many words, on which days, and a daily average. Go to Project->Writing History. That's right: now there's a menu that isolates dialogue, nouns, pronouns and adverbs, etc, by dimming the rest of the text. When I saw this for the first time, I laughed out loud because it was so incredible. Note that in the above screenshot Document Bookmarks is open on the right, meaning it displays bookmarked documents specific to that chapter and no other. As you see, there's a chapter title, a brief synopsis area, and below that room for making chapter-specific notes. 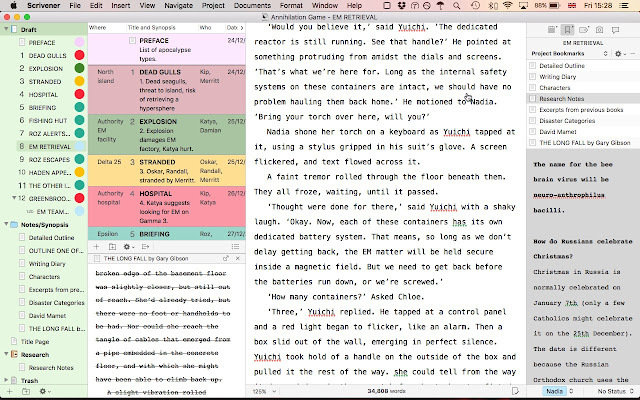 All I can say to finish is that, once again, Scrivener 3 has proved to be an absolute world-beater. By simplifying it, they've made it even more sophisticated. I'm very impressed. It's nice to know that perfection can be improved upon! This is great, Gary. I have a lot to explore. I'm glad I got this update for free since I purchased Scrivener after Aug. 20... by a hair! Having all those windows open (and having them stay open when you access the same chapter again) does seem to be very useful for referencing. Not sure if my last comment went through… I had to do about twelve Captcha’s and then my message disappeared. Having all those windows open (and stay open and docked when you return to the chapter later) seems pretty helpful for referencing.